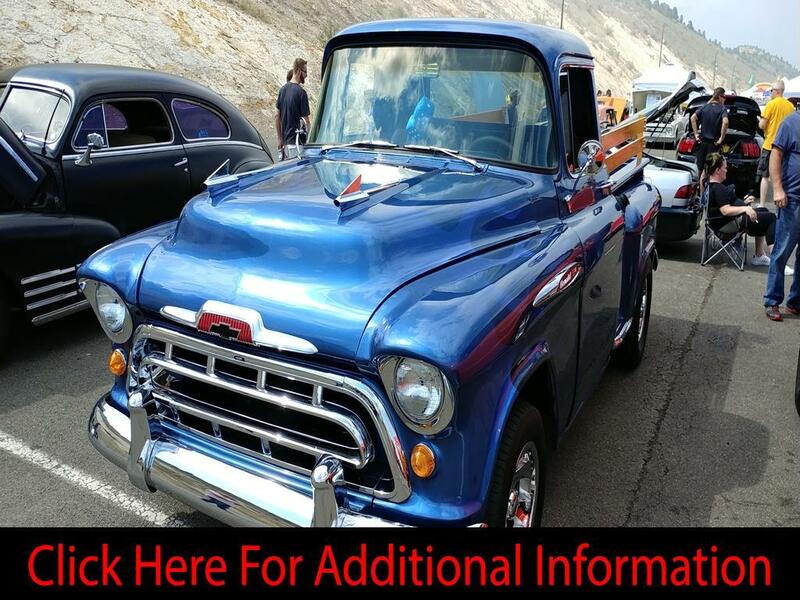 1956 Chevrolet 3100 Pickup, Off Frame Restoration, Custom Paint & Woodwork on Solid Steel Truck, Rebuilt 350 Chevy Motor w/3,000 Miles, Holly 650 Double Pump Carburetor, Headman Headers & Magna Flow Exhaust, Turbo 400 Auto 3-Speed Transmission w/Floor Shifter, 10 Bolt Rear End, High Speed Torque Converter w/Shift Kit, Ultra Motorsport Wheels, New BF Goodrich Radial TA Tires (Front-235/60R/15 Rear-275/60R/15). All New Tinted Windows, New Windshield & All New Rubber Molding Throughout Truck, New Chrome Grill & Rear Bumper & Sidesteps, Original Dash w/Original Radio. Aftermarket Alpine Stereo w/Booster, New Tilt Steering Wheel & Column w/Power Steering, New Taillights, Turn Signals & Headlights & Aftermarket Water, Voltage & Tachometer Gauges. Owner has over 30 Years’ Experience with Building Custom Cars & Trucks and did a Beautiful Custom Ghost Flame Paint Job in a 2000 Dodge Durango Blue Color. Custom Solid Oak Wood Interior & Bed. Truck has Standard Drum Brakes & No AC! Truck Runs & Drives Real Smooth. Be sure to check out the Youtube Video. The Truck has a 1957 Chevy Truck Hood & Front Chrome Grill which gives it the Extra Cool Look and the Side Emblems Reads 3124 but the Truck is a 3100. Items currently not working on the truck are: Dash Radio, Dash Heater, Dash Temperature & Amp Gauges & Wipers. Owner has wiper motor-just needs to be installed. Owner will be working on getting these fixed. Please No Trade Offers, No Broker or Marketing Calls! SMS Text Messages will not be answered-too many scammers! Showings are by Appointment ONLY for Qualified Buyers! Please have your Financing set up BEFORE you ask for a Viewing of the Truck. Call 72066030sixtwo. Additional info at nextstepprosales dot com Marketing Company for Private Sellers-This is a Private Sale-No Sales Taxes are Collected at time of Sale. Message: Thought you might be interested in this 1956 Chevrolet 3100.